SDCC 2018 and Star Wars Spoilers follows. 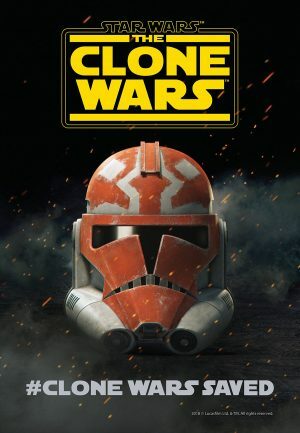 Star Wars: The Clone Wars is coming back. Let that sink in. Because you helped make it happen with your love for the series and unwavering support. Just announced by Dave Filoni at San Diego Comic-Con during a 10th anniversary celebration of the beloved animated series, Star Wars: The Clone Wars will be returning with 12 all-new episodes on Disney’s direct-to-consumer streaming service. Created by George Lucas, the show first aired in 2008 and became an entry point into Star Wars for an entire generation, following fan-favorites like Anakin Skywalker, Obi-Wan Kenobi, and Padmé Amidala, while introducing major new characters like Jedi Padawan Ahsoka Tano and Captain Rex. Its stories were complex, its heroes and villains were perfectly imperfect, and its look was captivatingly beautiful. It became a multi-Emmy winner and is now regarded as essential Star Wars. But it was never finished. The Clone Wars ended after five broadcast seasons — just as Ahsoka left the Jedi Order. A few post-Season Five episodes were later released as “The Lost Missions,” but the story wasn’t over. Fans have clamored for Disney and Lucasfilm to finish what was started ever since. And now it’s actually happening. StarWars.com recently caught up with Filoni, supervising director and shepherd of the series, to discuss the shocking return of The Clone Wars. You can also check out the trailer above, which debuted at the panel, and a striking new poster below.